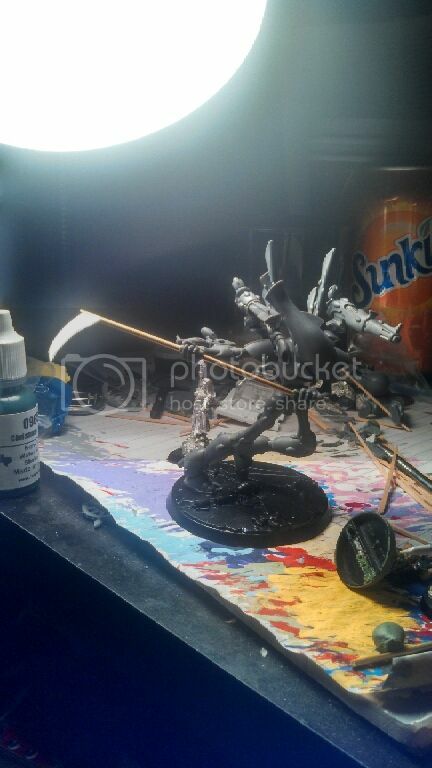 Okay, this is an odd place to begin my Averlon themed army that I am planning to work on, but I begin with a unit filler for my Everqueen's unit. It was an experiment, but I'm pleased with how it turned out. Hopefully in the next few days I will be able to get some stuff done to actually post up work on the army itself. Last edited by Domine Nox on Tue Mar 01, 2016 7:47 pm, edited 11 times in total. Weren't we just talking about this like a day ago?! How did you produce such a fantastic unit filler THAT quickly!! Really well done, it looks fantastic!! Thank you for the positive responses. @Il Maestro: Yeah, it wasn't long ago I asked about Unit FIllers, but the idea struck me and I had to go for it. I'm wondering, how did you make it? What did you use for the plant material? More continued thanks for the responses. The pieces I'm waiting on should arrive tomorrow so in a couple days I should have something to put up. Maybe sooner. @lordoftheshadows: The roots and stalk leading up to the seat as well as the arches in the back were floral wire. The thinner vines are copper wire wrapped around them. 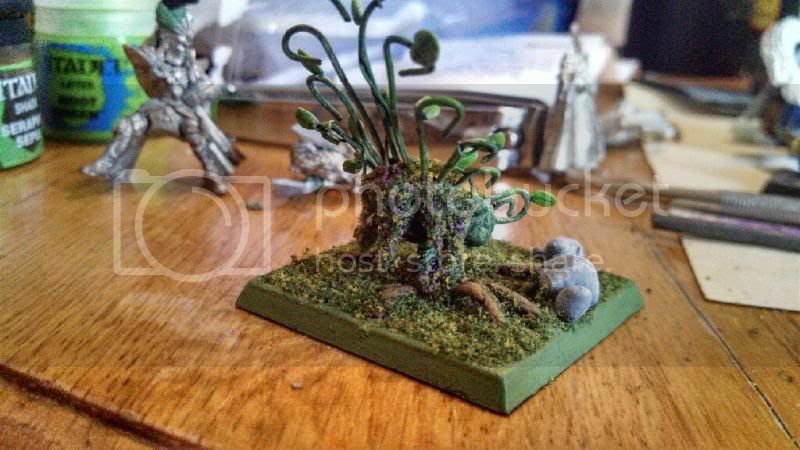 I sculpted green stuff on top of the roots to give them a non-smooth rootlike feel. 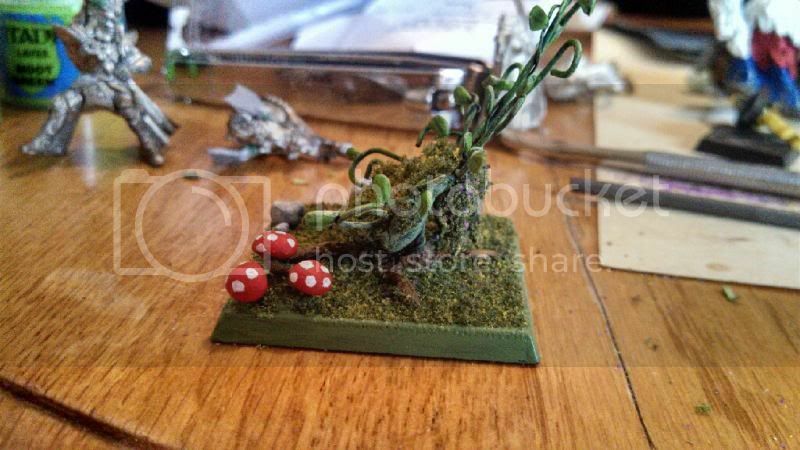 The rocks and mushrooms are also sculpted from greenstuff, as are the leaves and the seat itself. 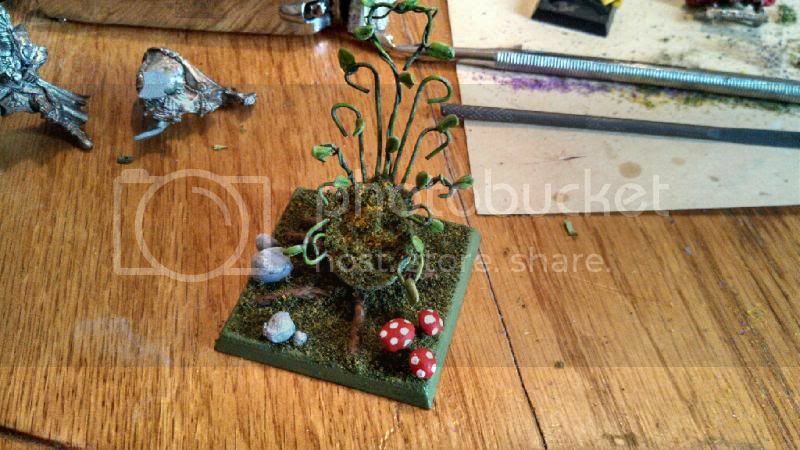 The wisteria vines on the back were thin little stalactites of green stuff that I simply glued flock mixed with purple flecks from a trainset flower terrain piece to. The seat itself is scrub and some yellow flecks. Love the idea, really well done. Looking forward to seeing this progress! 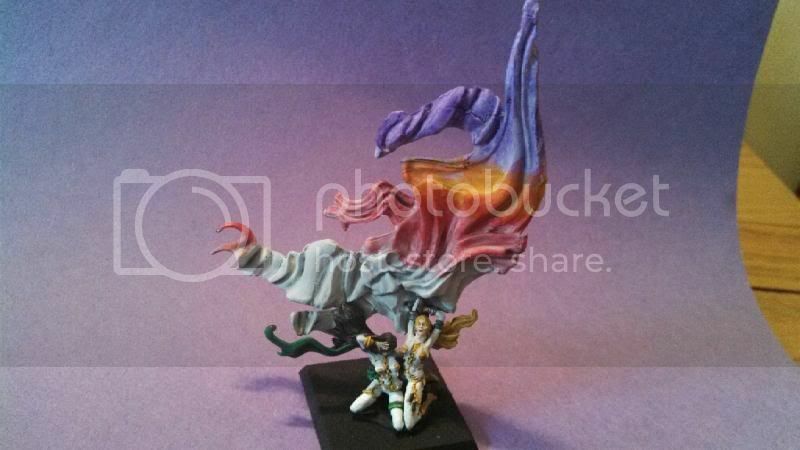 Well I completed my Alarielle. I am pleased with how she turned out. 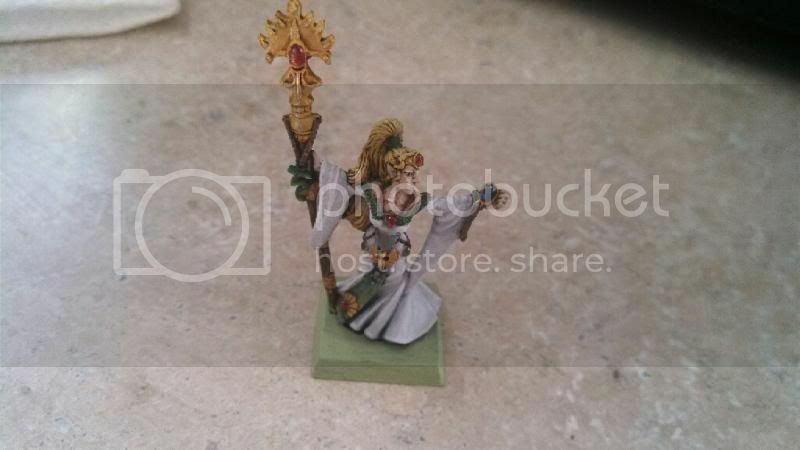 I have also done the champion for her Maiden/Phoenix Guard unit, but the pictures ended up crap so I'm going to take some new ones tomorrow. She's a lovely model, isn't she? I prefer the old version of her too (even if she seems a bit short comared with the newer models). And you've done a great job painting her up. I definitely prefer the old Everqueen to the new, she seemed more regal and pacifistic. So continuing forward with the project here is my Maiden/Phoenix Guard Champion. 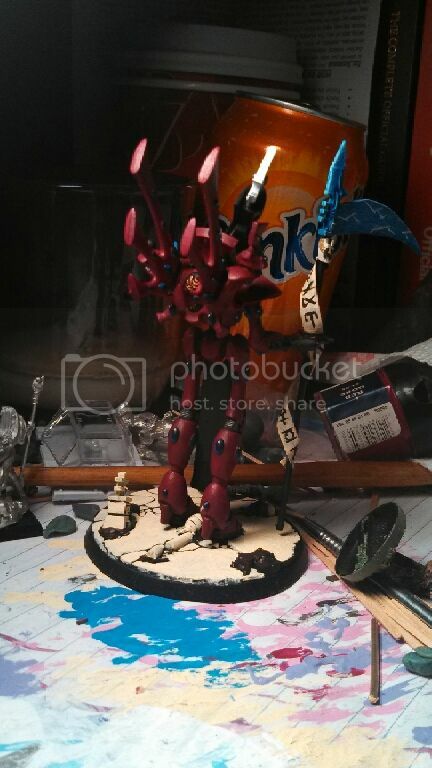 Also my mounted BSB. Yes I know he can't actually ride a Unicorn, but I had it, like it, and so felt he was a good place to put it. This is the rest of the Maiden/Phoenix Guard WIP. And since I'm showing maidens, I finally assembled my first box of the new Sisters of Avelorn, and I have to say I like the models. Bit lacking in the modular aspect to individualize them, but they are nice looking. Apologies on the photo quality, it's a tiny bit pixelated, only just realized upon posting them. Wish I had a better camera. 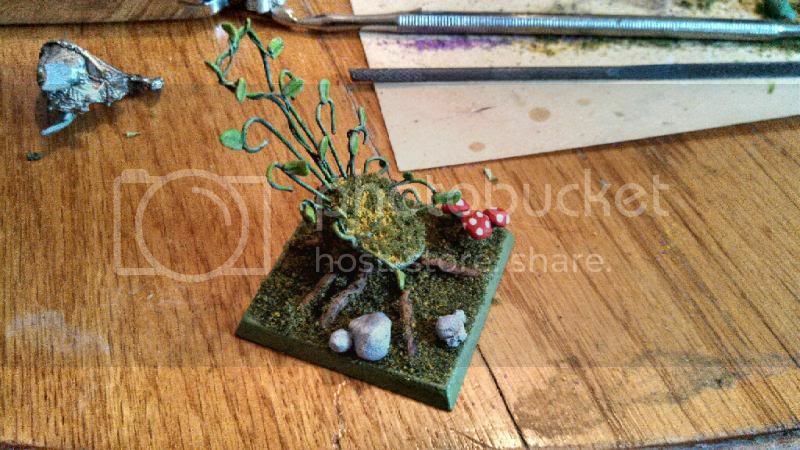 Took a sidestep to paint this fun miniature, just got a bit more to do to it to tidy it up and finish up gems and such. Still not sure what I'm going to use it for: Unit Filler? Objective Marker? 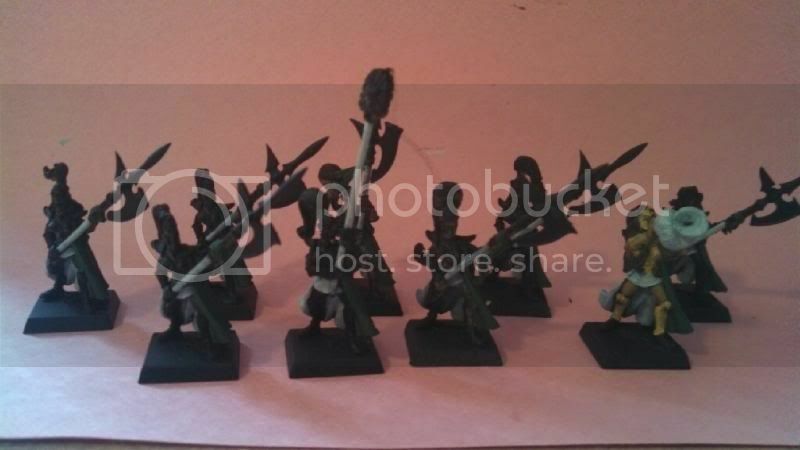 Decorative Army piece? I tried to make it seem like it was a white banner in the light of a setting sun. I think it kinda works. 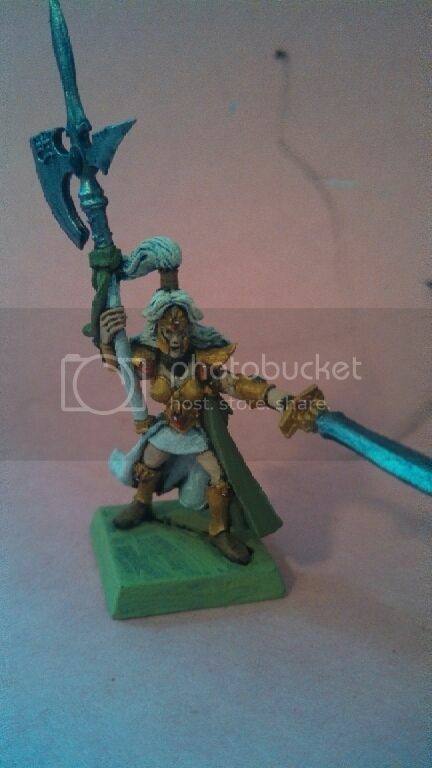 I think the old everqueen looks a lot like the old bret sorceress on foot...and I have the latter so I think I'll proxy her in the meantime (possibly with a staff swop) as the new model is awful. 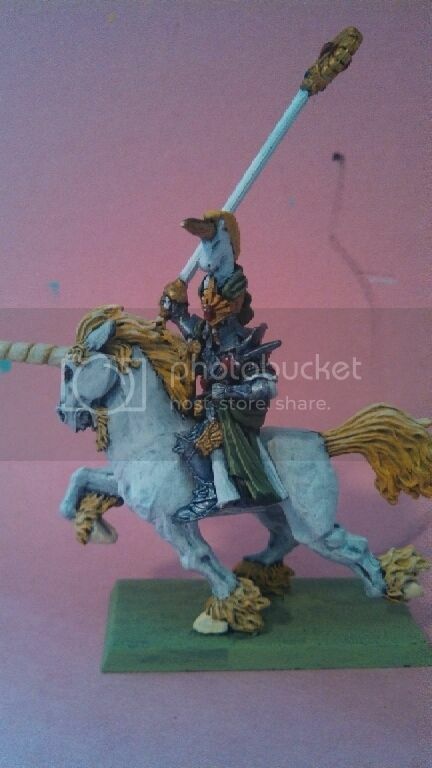 Loving your pheonix guard conversions, and the unicorn fits very well. Given that they don't exist for HE I don't think its confusing at all, it just adds character. I like your Maiden Guard -> Phoenix Guard conversions. It's simple but effective! The err.. unit filler thingy: that's an ambitious idea you've gone for and it looks really cool. Guess I'll steal a few ideas for my base design. Planned on using mine as Seaguard/speer proxy. 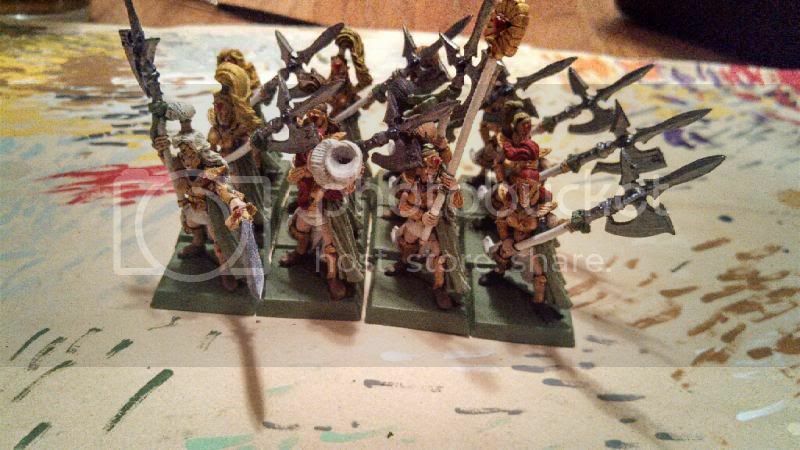 Okay, so been awhile since I updated, but the Maiden Guard are just about complete. 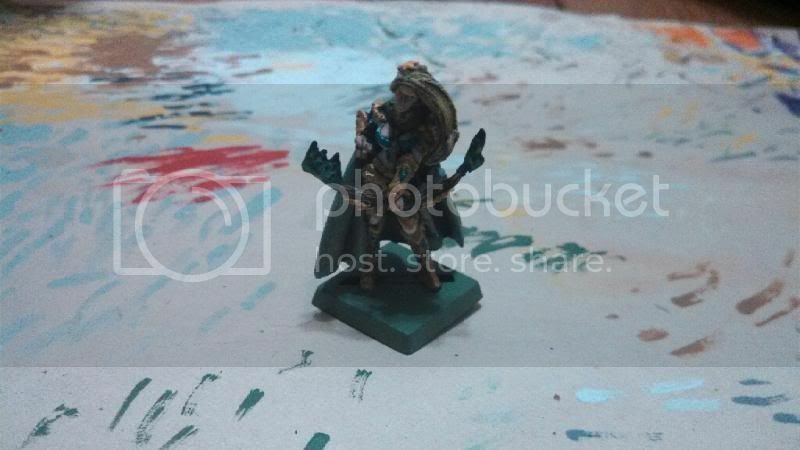 Also I have my Handmaiden of the Everqueen for my Sisters which are next up on the block. I have let this thing gather dust, but with reasonable reason. 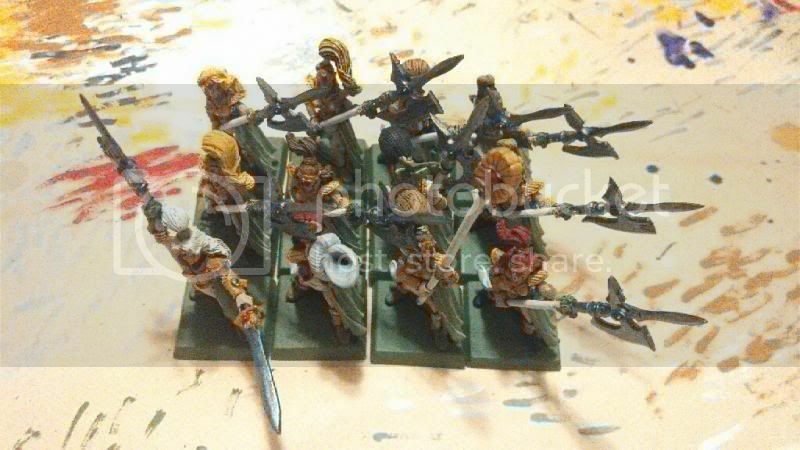 I have finished my first unit of 10 Sisters [Pictures coming]. 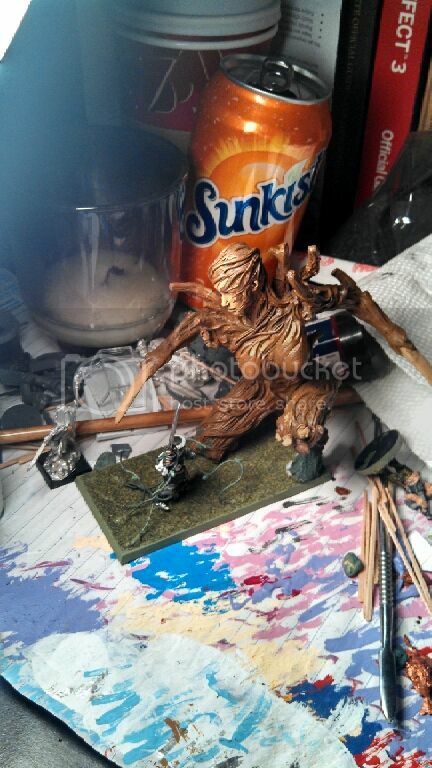 But I've also been working on a couple things for a local campaign I am part of, a baggage train, and Arcane Fulcrums. Also I am working on my Secret Santa project, which I wish I could reach out with, because I'm super excited about it. I should have some pictures up by Thursday or Friday of both new stuff, and better shots of the stuff that's already up there. 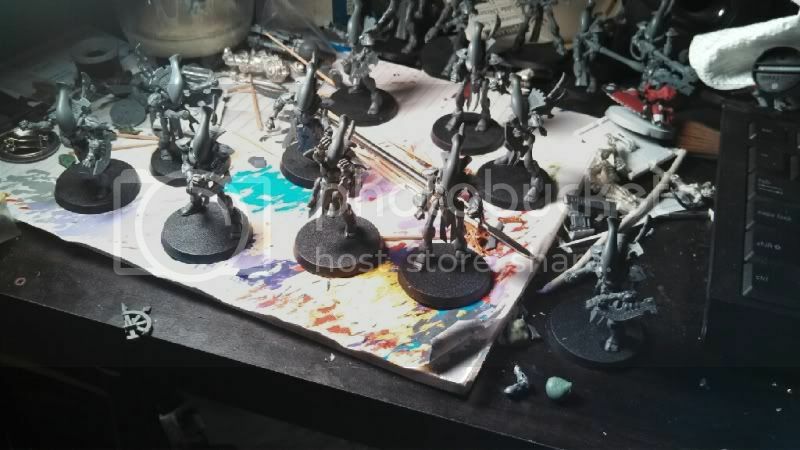 Well haven't made good on my promise, but I will I have an Arcane Fulcrum (2 in fact), the 10 Sisters, 5 Reavers, and my Treewoman Frost Phoenix to post up. BUT! I have a question that maybe people can help me answer that I thought I'd post here instead of making a new thread for it. I got a copy of the General's Compendium (yes I know it's not accurate for 8th edition), but a buddy of mine has 28mm scale boats that he built following the guidelines in the book, and I really want to build boats for my High Elves to do a naval battle. Now the big question is on sizes. I did a conversion of sizes from Man o'War, and by that my Eagle Ship (middle ship) should be about 28" long and 12" wide at the widest point. This makes it a LARGE boat by the boat rules. So should I shrink this down? Or accept that and then just worry about making some smaller boats too? The small boats just seem really small needing to be 6-10" in length. EDIT: Well nevermind apparenty my friend just wants to do 28mm Man O'War. So I just build the boats to the appropriate scale. These will be ridiculous. Eagle ship is 28" by 15". Dragonship is 31" by 24". And Hawkship is 21" by 11". With a minimum of 1 Dragonship, 1 Eagleship and 3 Hawkships... I'm gonna need a lot of building materials and storage. 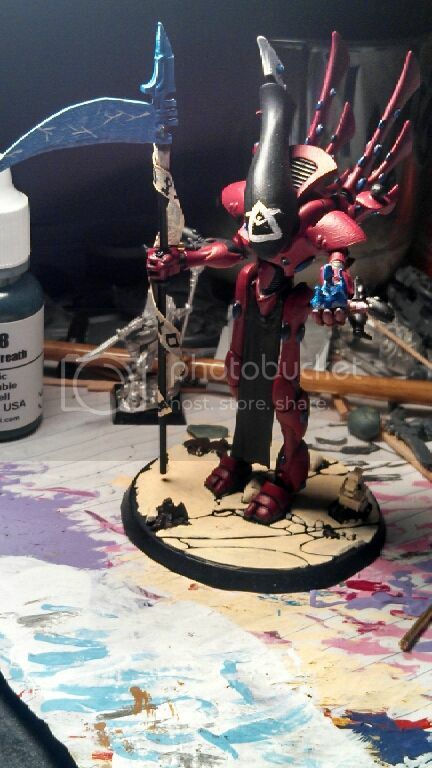 Well here's my Eldar Wraithseer that I built out of a Wraithlord. I just need to finish up his base and he's good to go. 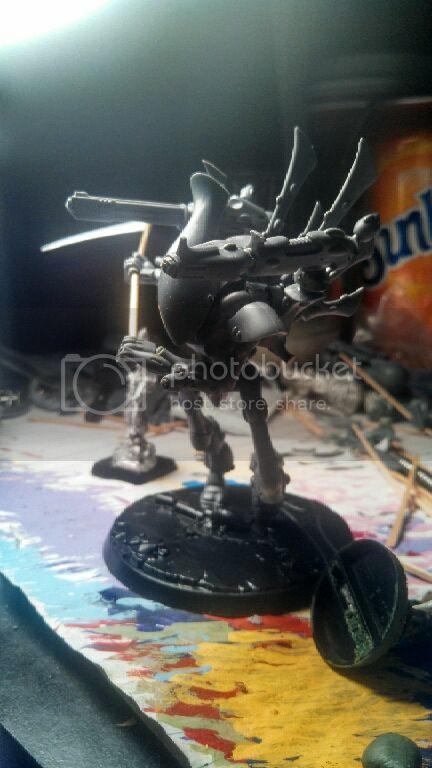 And this is my Wraithlord conversion. And something way way way overdue to have pics posted. 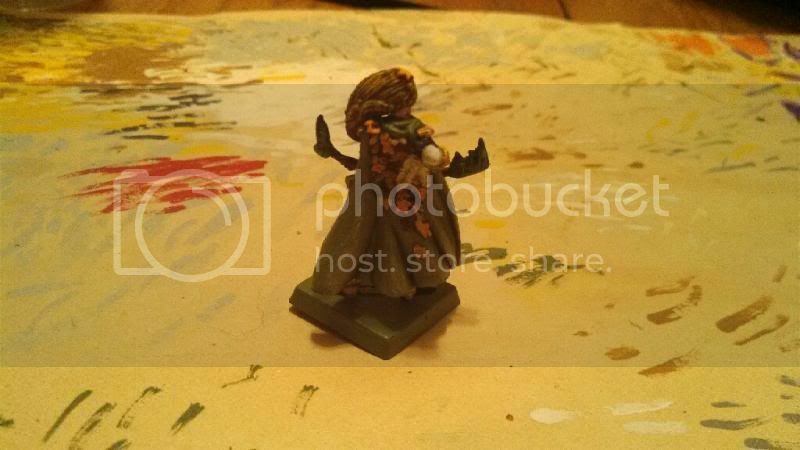 Since I don't like the Phoenix model and felt a big fiery bird didn't fit with my Avelorn army, this is my Avatar of Isha (counts as Frost Phoenix). 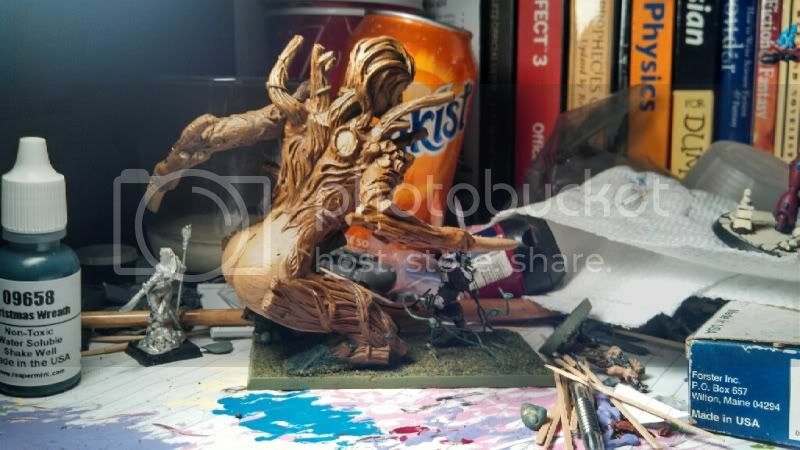 I love when people come up with creative and themed models to represent another in themed cases. Yours is so appropriate and a nice touch with the vines, I can totally see this robbing a unit of speed and strength in combat. I originally started doing a Caledor army thinking i would only be able to include spearmen, archers, silver helms and Dragon princes. 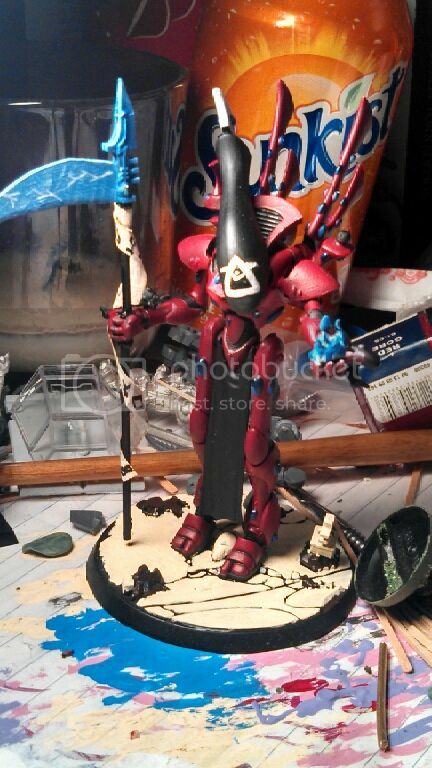 Coming up with models that are themed and use the rules for ones that don't fit is really fun actually. I'm using a noble on dragon to represent caradryan on asharti, to go "double dragon" without having to use the dragon mage. I will just make up something about the equipment causing the frost phoenix effect, and the phoenix's stat line is actually quite close to a moon dragons already. 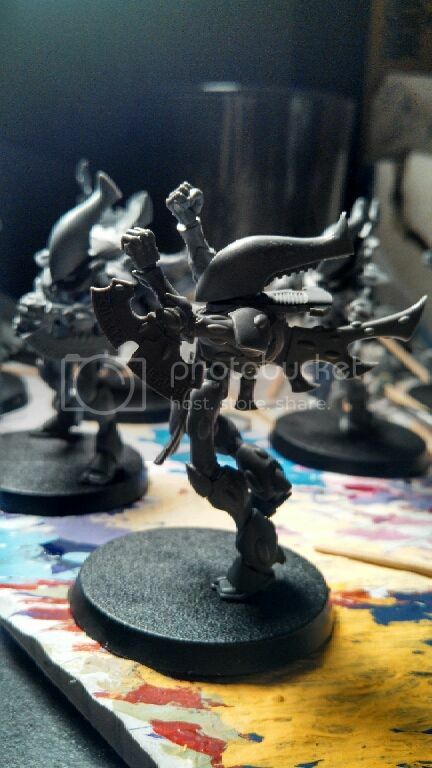 I plan to use Sea Guard as spire guard with some conversions. Thanks for the positive comments. I love 'counts as' conversions myself. 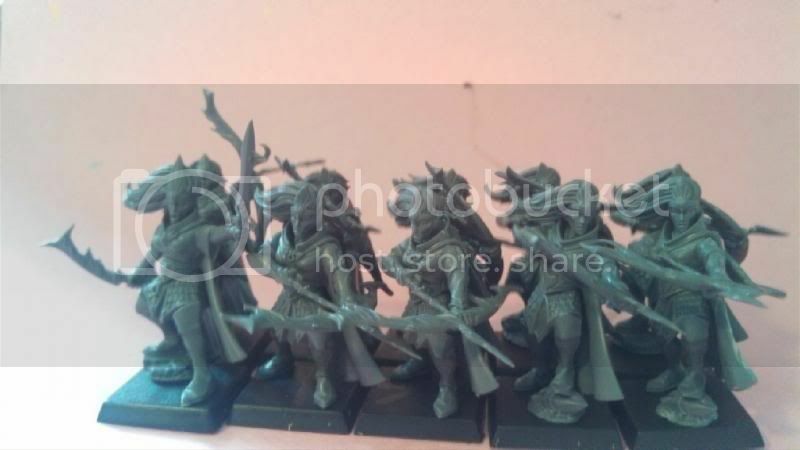 I have a unit of counts as Dragon Princes for my Avelorn force, they aren't even primed yet, but I'll put up some pics tomorrow as well as some more shots of my Avelorn force that I've been slacking on. I like what you've done with the unit filler. Are you planning on doing anything else with it (adding things to it, pehaps butterflies or something equally peaceful)? The avatar model, impressive. Where did it come from (call me ignorant...)? Are you planning on doing anything else with it (adding things to it, pehaps butterflies or something equally peaceful)? I hadn't planned on it, but that might be a neat idea. I might check into it. 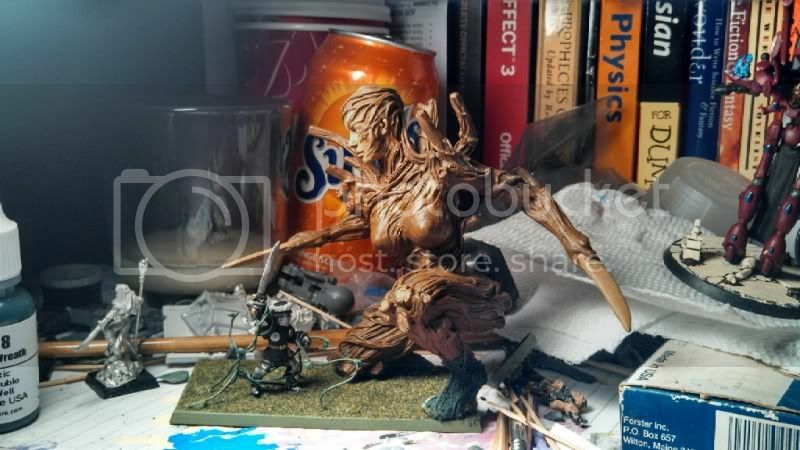 It is the Ultraforge Treewoman. Ultraforge? Much better than Superforge!! I like it though, and I like the idea of vines weighing the enemy down (to ASL). [EDIT]ALthough, personally, I'd have done more vines around the swordsman (perhaps wrapping right around his feet.